Mid bloomer. 5 deeply notched petals, leafless spike-like flowers. Grows on open slopes. Notes: Our species is probably Litophragma bolandari or Smooth Woodland Star. These are aptly named, as they look like delicate stars at the end of a magic want. 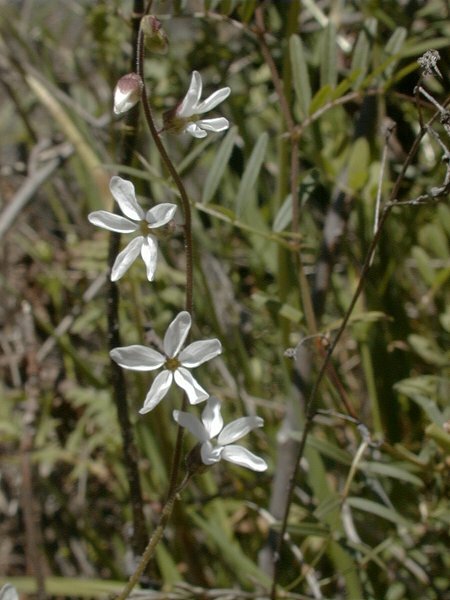 The white, unlobed flowers appear to be attached almost directly to the plant stem. It occurs on open slopes throughout the Sierra Foothills from 500’ to 5000’. Lithrophragma means rock hedge and Parviflorum means small-flowered. Bolander was an early 19th century naturalist. A related species is the Fringed Woodland Star, Lithophragma parviflorum, which have white to pink/lavender distinctly 3-lobed flowers.